VEM has sputtering targets available in a wide variety of precious and non-precious materials including pure elements, compounds and alloys in purities ranging from 99.9% to 99.9999% for both R&D and production. 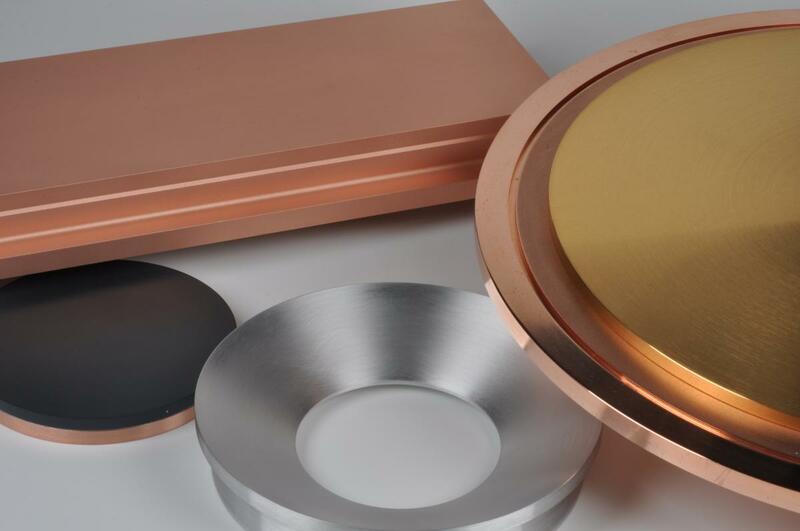 Our specialty sputtering thin film target materials include Au, Pt, Pd, Al, AlSiCu, AlCu, Cu, Ti, Ni, Ta, Nb, WSi, MoSi, NiPt, TiAl and WTi - in all target shapes and sizes - round, rectangular, S-Gun, ConMag, Quantum, Delta, Ring, multi-tiled and rotatable configurations - along with more standard sizes. In addition to Gold Au, Platinum Pt and Palladium Pd, VEM also provides Iridium Ir, Rhodium Rh, Ruthenium Ru, and Silver Ag precious materials. If we do not have the material, dimensions or shape that you need, you can make a request on the order page for a custom target in any of our available purities for your specific use. VEM's stringent quality standards ensure high quality targets resulting in reduced costs and increased uptime. Each sputtering target ships complete with a Certificate of Analysis and SDS. In addition, we povide a wide assortment of PVD precious metal alloys - Gold Antimony, Gold Copper, Gold Germanium, Gold Nickel, Gold Nickel Indium, Gold Palladium, Gold Phosphorus, Gold Silicon, Gold Silver Platinum, Gold Tin, Gold Zinc, Manganese Platinum, Palldium Manganese, Palladium Nickel, Platinum Palladium, Platinum Rhodium, Platinum Iridium and Silver Copper - along with sputtering target bonding and metal reclamation services. Our high purity source materials result in exceptional surface cleanliness. We manufacture all shapes and sizes of high-purity and high-qualtiy sputtering targets for a wide variety of OEM platforms. Our high-purity raw materials and fine-grained sputtering targets result in optimal thin film coatings. Let us know the material and dimensions you need on the order page and we'll deliver to your requirements. If you let us know what OEM tool you use, we probably have the specifications. Contact VEM today - the most trusted partner for PVD materials - for the most competitive pricing and delivery.